52 Blocks Coach Lyte Burly recently returned to the Alliance gym here on Swamp Road for a quick visit. And though he was only here for half a day we managed to capture a whopping 15 gigabytes of video and I know you'll be pleased with the results! On the first new video Lyte breaks down the footwork of 52 Blocks, the shapes of movement, how to use your blocks with your footwork, and how to use footwork alone as defense. If you've watched clips of him sparring on YouTube then you know his footwork skills are top notch, and here you'll get the specifics of how to develop the same skills yourself. While footwork isn't as obviously important to the novice in the way that things like speed or power are, it is a defining attribute for all forms of combat � striking, grappling, or using weapons. So literally by improving this one area it will elevate all of your current skills to a new level. * Learn the correct stance and balance for fighting. If you get hit a lot while on defense it might just be that you have your weight on the wrong foot! Make this once change and it will cure that right away. * Detailed instruction on the step, shuffle, and pivot for 52 Blocks, the foundation of dynamic movement. * How a boxing coach helped make a world champion by tying his feet together and how to use the updated version of this for your own development. * How to apply geometric shapes of motion to perfect your footwork angles and develop freedom of movement in every direction. * Using your 52 Blocks hand skills with your footwork for ultimate shadowboxing. * Partner drills for defending against punches using your footwork. Once you know the body angles, shoulder roll, and other tricks Lyte shares you'll be able to do it too. To drive home the value of high level footwork, here are quotes from two of the world's premier striking arts � Boxing and Wing Chun. 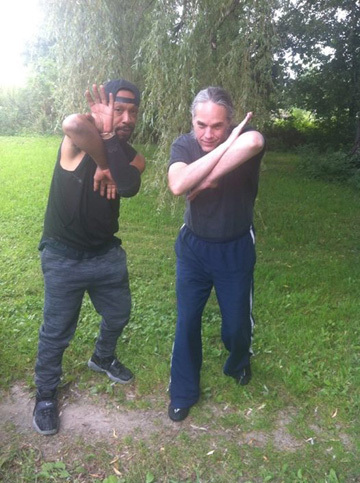 In Wing Chun one of the Kuen Kuit states �The hands are like arrows, the feet are like wheels.� The analogy is to a war chariot, and we can immediately imagine this deadly combination of mobility and firepower. Bad footwork would be like having a chariot with square wheels or no horses!